Well, I thought it was over. Evidently the Democrats still want to go after us. Under pressure from Senate Armed Services Committee Chairman Carl Levin, the Pentagon inspector general has taken the unusual step of withdrawing a report that exonerated the Pentagon of wrongdoing related to a program that used retired military officials in a public relations campaign. Deputy Inspector General Donald M. Horstman stated in a May 5 memorandum that the report was taken down from the IG Web site because of unspecified "inaccuracies" related to data in an appendix on retired military analysts' relations with defense contractors. The memo said an internal review found that the report failed to meet "quality standards" because it used Internet searches to check on corporate affiliations of military analysts involved in the program. Withdrawal of the IG report followed a report in this space April 23 that stated that retired military officers, many of whom appeared on television, were angered over the awarding of a Pulitzer Prize for reporting on the issue. The withdrawn IG report, released in January, rebutted the major allegations of the New York Times' winning story that asserted that retired military officers had improperly used private Pentagon briefings to gain unfair competitive advantage for defense contractors they represented. The IG pulled the report after Mr. Levin, Michigan Democrat, wrote to Defense Secretary Robert M. Gates on Feb. 2 rejecting the IG report and asking him to have the IG office conduct a second investigation. In his letter, a copy of which was obtained by Inside the Ring, Mr. Levin asserted that using friendly retired military officers to support Pentagon policies should be illegal. He also requested that the IG carry out additional "review and analysis." 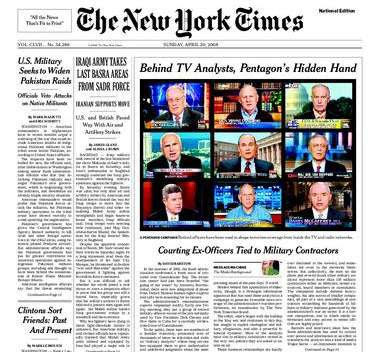 In April of 2008, The New York Times published a front page article by David Barstow, "Behind TV Analysts, Pentagon's Hidden Hand," accusing the Department of Defense of mounting a propaganda effort using retired military officers working as on-air analysts from various broadcast media organizations. I was named as one of the analysts involved. The story is inaccurate - my responses when the article was published: "Response to New York Times Article on Military Analysts," and "Response to Rumsfeld Luncheon Reports." The article set off at least two investigations, one by the Defense Department's Inspector General, and the other by the Federal Communications Commission in response to a letter from Representatives John Dingell (D-MI) and Rosa DeLauro (D-CT). I regard the latter as politically motivated. I responded to the insulting accusations put forth in the Dingell-DeLauro letter that questioned my integrity and besmirched my 28 years of military service. I have not heard anything of this inquiry since - I think I know why. Soon after President Obama took office, he asked Secretary of Defense Robert Gates to remain in his position, and Dingell was replaced as head of the committee that oversees the FCC. It would be difficult for the administration to now go after the Secretary of Defense after he was asked to stay on by the new president. In January 2009, the DOD IG concluded that Retired Military Analyst Program did not "violate the prohibition on publicity and propaganda," and the program was "conducted in accordance with DoD policies and regulations." The IG report further stated, "We found no indication that partisanship was operative during the interchanges with [retired military analysts] and found no evidence that the Office of the Assistant Secretary of Defense for Public Affairs personnel sought to somehow avoid portraying DOD as a source for the information provided. Rather, the briefings were open and transparent." Surprisingly, the author received a Pulitzer Prize for the article. I will have to re-evaluate my opinion of the Pulitzer Prize committee. James Davis, a former DOD public affairs officer involved in the program, penned an excellent response to this misguided award. The article, "Behind Pulitzer Prize, The New York Times' Hidden Agenda" appeared in today's on-line version of the conservative magazine Human Events. These analysts are career military officers who rose through the non-partisan ranks of the military through a combination of hard work and ability to lead. It is awfully presumptive to state that they would stake their reputations for politics. The Pentagon seeks to inform military analysts so they are better prepared to report on DOD policies whenever a reporter calls, whether they are from CNN, The New York Times, or FOX News. The conclusions drawn in Mr. Barstow’s New York Times article aren’t surprising. The New York Times had an agenda from the beginning. They filed the FOIA request from the DOD in hopes they would make news, and they did. Instead of erupting into applause when the Pulitzer Committee’s results were announced, The New York Times should have issued an apology to the retired military officers. More importantly, have the standards of the Pulitzer Prize committee dropped this low? Is this standard of journalism really worthy of any award? James, I couldn't have said it better.